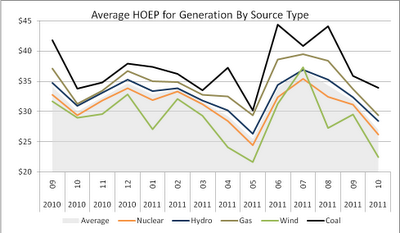 The comparative value of of each generation source in Ontario’s electricity system is measurable. I’ve written on this before, and recently read a couple of encouraging articles noting the shortcomings of the LUEC (levelized unit energy cost), or LCOE (levelized Cost Of Electricity) tools in evaluating electricity generating technologies. [i] Presenting some of the data I’ve collected, in a slightly different way, will emphasize the need for a value analysis that also considers the supply mix, and demand characteristics.. The analysis indicates Ontario’s recent electricity planning foibles will not provide a low-emissions, sustainable, electricity supply. 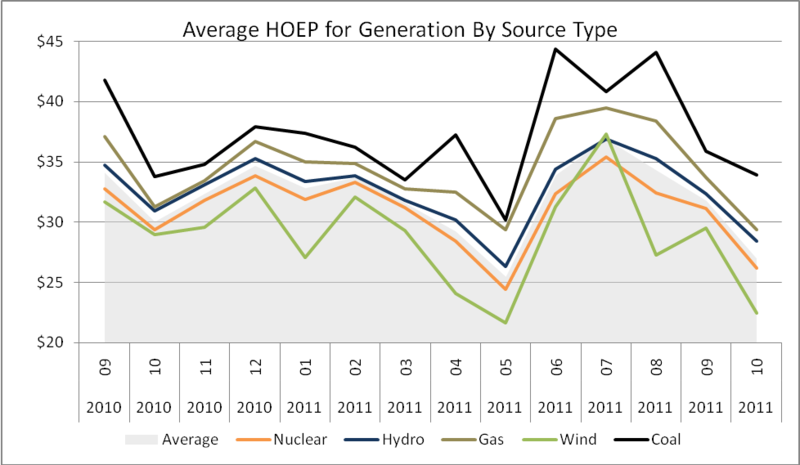 The Hourly Ontario Energy Price (HOEP) is not a real market price – because over 90% of our supply is contracted in advance, which heavily distorts the market. However, it mimics a market price, in moving based on the supply/demand metric. The graph above, demonstrating wind is consistently the least valuable production, and coal the most valuable, looks a little different for Ontario than it would in most of the world, because Ontario is phasing out coal, and currently utilizes it primarily as an intermediate source of generation (not, as most do, as baseload). [i] The expectation is that intermittent supply will be the least valuable, and peaking supply (in many jurisdictions natural gas) would receive the highest price as it would be disproportionately used during higher demand periods. Aside from flipping coal and natural gas, the relationships between generation-type characteristics, and demand, is as expected. Sources which can be managed to match output are worth more. 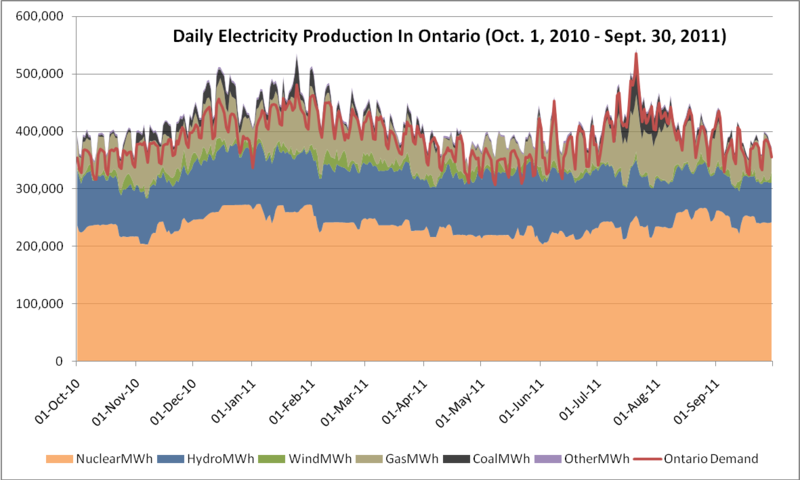 Adopting the form of some of the graphing I did for my Cost of Wind series, with actual daily production totals from October 2010 through September 2011, it is apparent why coal is the most valuable, in Ontario, as it is used primarily during periods of high demand (hot, or cold, days). Ontario is an exporter, as indicated by supply exceeding demand all but 1 of the 365 days shown. December 2010, May 2011, and January 2011 are the top 3 net export months recorded in IESO data. 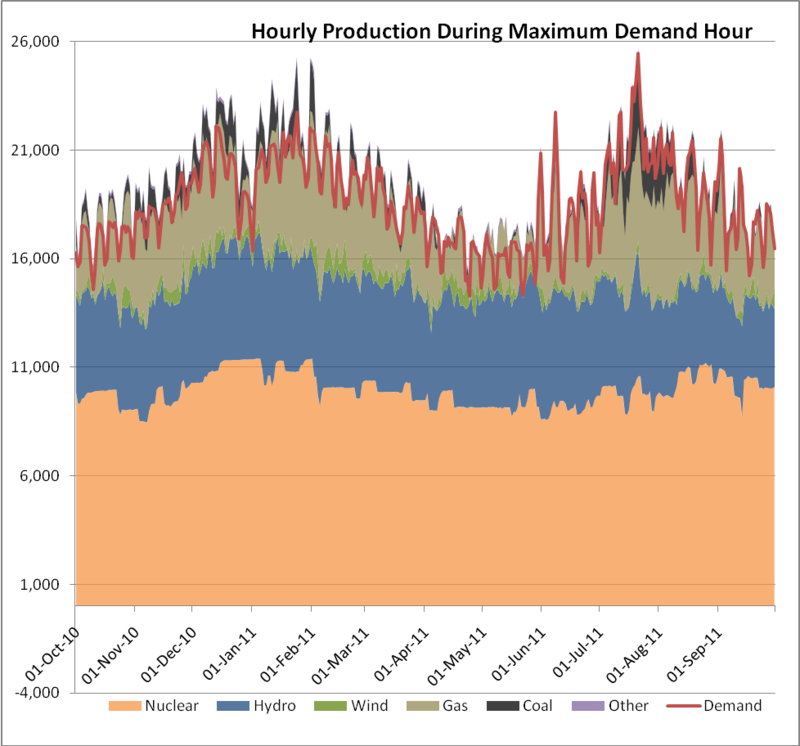 In order to get a truer picture of the complexity of the supply, I’ve produced graphs of generation, by source, for the hour of lowest demand each day, and another, on the same scale, at the highest demand level of each day. From the production at the minimum demand periods, the long-standing policy of providing baseload (minimum demand) from low GHG-emitting sources is apparent. Although Ontario's mix commits to about 1000MW of other, primarily natural gas, supply at all times, the bulk here is nuclear and hydro - and that mix frequently exceeds the daily minimum demand. 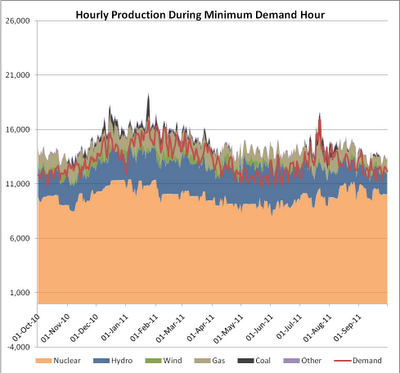 Periods where nuclear plus hydro plus 1000MW exceed demand are periods of Surplus Baseload Generation (SBG). May 2011 is a great example of excess supply, and it ended up as the second highest net export month since IESO records start. The other necessity of an electricity system is meeting peak demand, and here the supply did match demand, very well, after the huge exports of last December and January were curtailed (those months are #1 and #3 in the top net export month list). The important piece of information is that, at the annual peak, demand matched supply, and supply included coal. The exports of the winter, largely fueled by natural gas and coal generation, aren't as relevant as they appear, in terms of curtailing GHG emissions. That's because the exports go either to Quebec - where the power eventually ends up replacing carbon-based sources in New England, or directly to the US where it would displace carbon-based sources. Whether Lambton runs or the Michigan coal-fired plant almost directly across the St. Clair river from Lambton does isn't of interest globally. It's relevant only for grandstanding locally. Comparing the daily minimum and maximums, along with generation mix during each scenario, emphasizes why the Germans found that increasing renewables impacted their market as it did - erratic, and negative pricing, increased exports (overproduction), and finally the perceived need to eliminate an actual source of reliable supply, in their nuclear units (I wrote on this here). Wind will frequently displace nuclear or hydro in the existing Ontario mix, and it will frequently fail to contribute to meeting peak periods. This is one reason the LUEC is not particularly relevant. I've not often addressed solar, because of a lack of real data in Ontario. Germany's Bavaria provided some expected information recently, as it was reported the grid was being maxed out during peak solar production, while solar generation was producing 8% of their annual production. This makes sense. If solar has a capacity factor of 15%, and minimum demand was 8000MW, 8000 MW of solar would provide all demand at some point but only 8% of an average demand of 15000MW. These figures will vary from jurisdiction, but the message doesn't. The ability of solar to contribute above a very minor level requires frequent over-production. The more solar, the less relevant the LUEC is. Peak demand in much of Europe is on winter evenings - and peak demand in Ontario's January is also in the evening. A system requires solar be matched by full backup - in Ontario's case there may be an exception for a smaller amount of solar to match summer peak, but only if natural gas is used for heat in the winter (energy use will be higher during winter evenings, but currently less of that energy is electrical). The claim has been made that the value of solar is therefore simply the cost of the fuel, from the requisite natural gas, or coal, production it displaces when available. The same claim is applied to wind generation. 7500MW of nuclear capacity would provide 50% of the power to a jurisdiction that average 15000MW, while 7500MW of solar capacity would provide 5%, and reduce the economic viability of the nuclear supply while doing so. The LUEC models don't account for system factors. The solar industry has been working on a technology to address that issue. The promise of concentrated solar power (CSP) is a far better ability to meet demand, and therefore much increased value over the more ubiquitous, and cheaper, photovoltaics (PV). However, when jurisdictions are either run by feed-in tariffs (FiTs), or even the more consumer-friendly Renewable Portfolio Standards (RPS), we are starting to see the replacement of more valuable supply, meaning capable of meeting a demand need, with cheap intermittent sources - most apparent as PV replacing CSP projects (see here and here). Ontario's FiT program is predominantly a program for solar PV, and Industrial Wind Turbine (IWT), projects. Neither of which provides valuable output. FITs essentially lock-in to chosen, existing, technologies. In Ontario's case those are probably poor technologies to choose, but, more importantly, the act of choosing preferred technologies discourages innovation towards real clean energy solutions. The Clean Energy Patent Growth Index tracks innovation, via US patent applications. In the most recent quarter Canada had 9, while New York state had 52, and the long term trend line for Canada is not indicative of an innovative society. Year-end reports for 2009, and 2010, show Canada as an innovation laggard, one that is not improving nearly as quickly as many, and far less than the USA. This is entirely expected too, as the RPS tool is far better at encouraging improved efficiency than a FiT program. James Hansen's recent 'Baby Lauren and the Kool-Aid' article illustrated the difference, as he chronicled a collapse of 75% in the pricing of Pennsylvania's Alternative Energy Credits (a type of RPS), between his commitment to a PV home installation, and the time he sold back a single watt to the grid. Ontario's FiT program puts the entire risk on the consumer - which is something that wouldn't be allowed by an effective regulator (ie. something like the Ontario Energy Board, but more effective regulatorish). With our emphasis on paying outrageous amounts for old technology, lacking in prospects of reducing our GHG emissions, there should be no expectation either the abandonment of the consumer, nor the inability to improve on an already comparatively clean generation mix, will change. Look for the failure of the strategy to be covered up in Ontario, as in Germany, by a redoubled effort to discontinue nuclear's actual low-emissions generation. [i] Intermediate meaning to meet peak periods, but not as a peaking source ... once a coal unit is started it is desirable to keep it hot. Speaking in broad generalities, in the daily production chart it therefore usually runs for a period of time over days (although it can be reduced to 20% of capacity overnight) – gas would run for a couple of hours (but must run at 60% capacity, for the newest CCGT units, or not all). agreeable from you! By the way, how could we keep in touch? a magnificent job in this subject! Hello, everything is going fine here and ofcourse every one is sharing data, that's genuinely excellent, keep up writing. Howdy very nice site!! Man .. Excellent .. Superb .. I will bookmark your web site and take the feeds also? Hi! I'm at work browsing your blog from my new iphone! Just wanted to say I love reading your blog and look forward to all your posts! Keep up the fantastic work! What a material of un-ambiguity and preserveness of valuable know-how about unexpected emotions. with spelling problems and I find it very bothersome to tell the truth however I'll definitely come back again. your post on AOL? I need a specialist on this house to solve my problem.